XCrypt ransomware uses sophisticated techniques to infiltrate computers and hide from its victims. Use Reimage to determine whether your system is infected and prevent the loss of your files. How to remove Xcrypt virus? All the important files on your PC were encrypted. To decrypt them, you should send 0.26 BTC (~100euro) to Bitcoin address: [removed] and in the description field type in your email address. As you can see, the virus wants you to pay money (100 Euros) to get your files back; obviously, it is a form of blackmail and extortion, and you should not carry out these commands! Instead, we recommend you to remove XCrypt virus as soon as you can. No matter that frauds promise to provide you with information on how to decrypt data if you pay the ransom, do not believe them – we know cases when criminals asked victims to pay even more  after the initial ransom payment was transmitted. Better keep your money to yourself, and use it for a better purpose. We would also like to draw your attention to the fact that ransomware is a complicated program and it is not so easy to remove it, so we recommend you to use a good anti-malware software for Xcrypt removal. You can use Reimage software if you wish, or any other legitimate program described in the Software page on our site. Our analysis shows that Xcrypt ransomware mostly spreads via infectious emails, which supposedly deliver certain documents to computer users. No matter what kind of attachment an email letter contains, do not open it unless you are sure that it is safe to do it. Remember that frauds send out thousands of letters containing malicious files  entitled as “Scan/invoice/bill/fine/payment/prize/report” and so on, which seem trustworthy at first sight. However, you should think twice whether you were supposed to receive such email and if it really comes from the company that the sender swears to be working at. We suggest you carefully look at senders email and, when in doubt, double-check sender’s reliability by contacting the company via its official website. Do not blindly open such letters and especially files attached to them because they can contain a destructive payload. Be careful – it is better to be safe than sorry! Xcrypt virus infiltrates computers with the help of malicious email attachments, replaces regular file extensions with .xcrypt and drops a ransom note demanding money. Virus researcher Jakub Kroustek has reached out to the internet community with some unpleasant news , especially for the users currently residing in the Russian-speaking countries. The expert has detected a new version of Xcrypt ransomware that “speaks” to its users in Russian. What is interesting is that the initial course of the system infiltration is no different to the one observed in the previous virus versions. Even the file original .xcrypt extensions remain in tact; nevertheless, this time, instead of addressing the users in English, the hackers list their demands in Russian. There is also a new feature related to the communication between the victims and the extortionists. Now, the hackers use ICQ (a free messaging and call network) network to communicate with the victims which helps retain the anonymity and discretion of the interactions. In other respects, Xcrypt it the same dangerous and destructive virus that it was before. Keep in mind that though the virus is targeted towards the Russian-speaking users, in reality, any device connected to the web is not immune to cyber infections. Thus, you should stay alert at all times. If the PC has been compromised by this virus, do not waste any more time and remove Xcrypt virus right now. For that, employ anti-malware software like Reimage. It is a trustworthy program that provides a lot of beneficial features. It has also proven to be a powerful malware remover that can identify and eliminate even the latest malware examples. Please start your PC in a Safe Mode with Networking before trying to launch the anti-malware software. Log in to your infected account and start the browser. Download Reimage or other legitimate anti-spyware program. Update it before a full system scan and remove malicious files that belong to your ransomware and complete XCrypt removal. When a new window shows up, click Next and select your restore point that is prior the infiltration of XCrypt. After doing that, click Next. Once you restore your system to a previous date, download and scan your computer with Reimage and make sure that XCrypt removal is performed successfully. Guide which is presented above is supposed to help you remove XCrypt from your computer. To recover your encrypted files, we recommend using a detailed guide prepared by 2-spyware.com security experts. 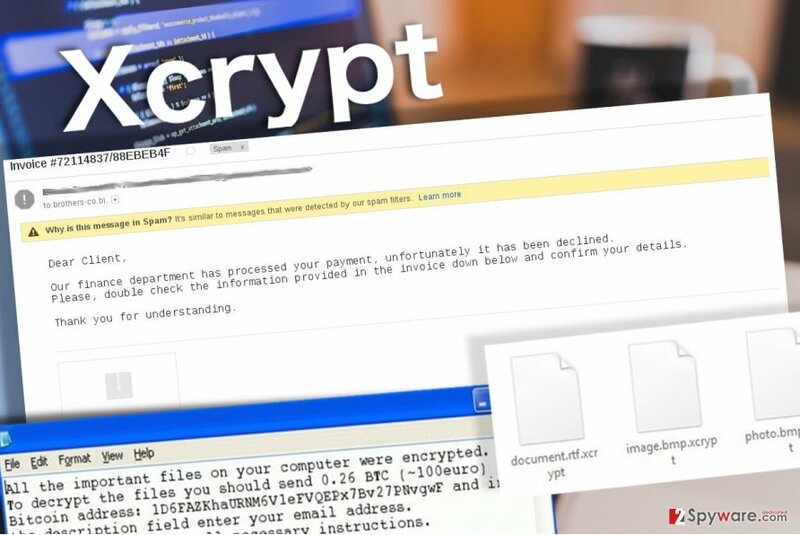 Files encrypted by XCRYPT are strongly secured and sadly, we do not have a decryption tool that could decrypt your files. However, you can try to restore encrypted data using Windows Previous Versions feature. IMPORTANT. This method is not efficient if you have never enabled System Restore function. Some viruses “forget” to erase Volume Shadow Copies, which are essential for data recovery. If the virus that has affected your computer has been developed by a quite foolish programmer, there is a great chance that your files can be recovered. Follow these instructions to check if Volume Shadow Copies have been deleted or not. ^ Chris Brunau. Common types of ransomware. Datto. Total data protection platform. ^ Rick Correa. How fast does ransomware encrypt files? Faster than you think. Barkly. Barkly antivirus blog. ^ Ransomware: should you pay the ransom?. EY. Building a better working world..
^ Sergio Galindo. 12 things you should know about email, spam and file attachments. TechRadar. IT Insights for Business. ^ Jakub Kroustek. ‏Xcrypt Russian version. Twitter. It's what's happening.. This entry was posted on 2017-01-30 at 03:41 and is filed under Ransomware, Viruses. You can quickly scan the QR code with your mobile device and have XCrypt ransomware virus manual removal instructions right in your pocket. How did you remove XCrypt virus?